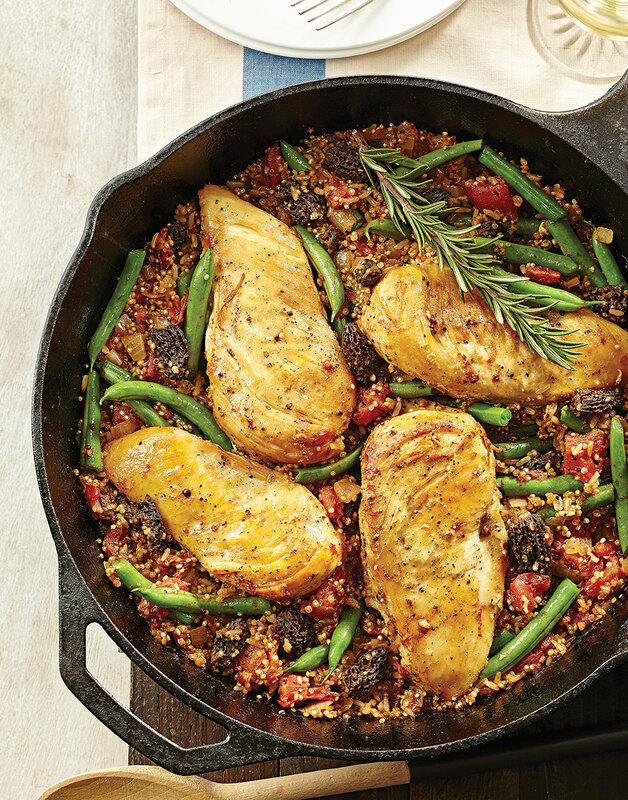 This chicken dish, done with French flavors and a little elegance, is built around a box of herb-flavored quinoa. Similar to a rice pilaf, it’s a nutritional powerhouse by comparison. And don’t scrimp on the dried morel mushrooms — they’re the best part. Brown chicken in oil in a cast-iron skillet over medium-high heat on one side, 5 minutes; transfer to a plate and loosely tent with foil. Add onion to skillet; cook 3 minutes. Add tomatoes, water, and mushrooms; bring to a boil. Stir in quinoa (and seasoning packet if desired) and green beans; return to a boil. Return chicken to skillet, browned side up; cover and transfer to oven. Roast chicken and quinoa until all liquid is absorbed, 18–20 minutes. Remove skillet from oven; let stand 5 minutes, then fluff quinoa. For ideal presentation, brown one side of the chicken. It will finish roasting in the oven. This recipe calls for dried morel mushrooms, but if you have fresh morels you can use them. This easy make-ahead dessert is so creamy, chocolaty, and tempting you may want to make a double batch!